Nas-Karts the closest ride to the real thing! 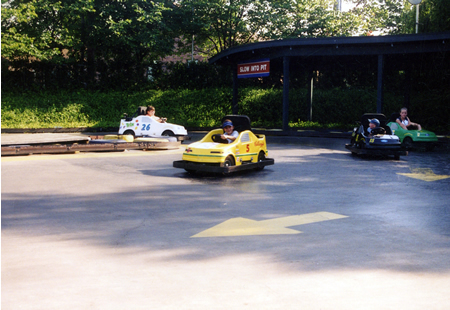 Race your friends and family around Centerfield Speedway. Try to slip inside to pass without hitting the rail, Experience how it feels to be Bobby La Bonte, Jeff Gordon and others! Enjoy old fashioned go karts on a slicked down track. This track will test your driving skills. Mini Nas-Karts, gas powered kids karts. A ride for young children to learn about driving, braking, and road etiquette in a safe environment. Kidz-Kartz, electric powered cars designed for your children. Safe, slow and sure to be fun for the wee folks! Remember when you learned to drive? Whatever your taste... you set the pace! Rookie Karts - $6.00 Height requirement is 4ft tall.